I recommend you use a minimal amount of sugar to roast the fruit, then taste the puree once it has cooled. If you require more sugar then it can be stirred into the mixture at this stage. Freezing the puree will dull the sweetness of the mixture, so make sure it is not too tart to begin with. 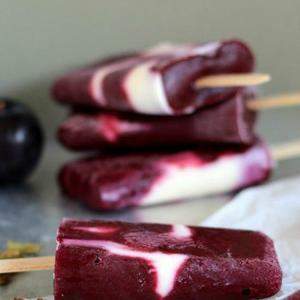 If you cannot be bothered making popsicles, the plums make a great dish on their own for breakfast, dessert or for a quick snack. Dollop the yoghurt on top.